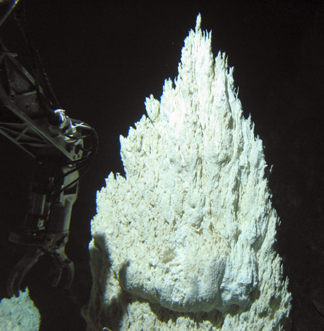 After the chance discovery in 2000 of the white spires of a hydrothermal vent community, Deborah Kelley of the University of Washington and her co-workers were able to revisit the surprising site in 2003. They found a community of deep-sea dwellers, which rely on hydrogen and methane, in a submarine tectonic setting with a distinct geologic signature. The team's discoveries have a wide range of implications, from Earth's methane cycles to the search for early life forms  and life elsewhere in the universe. This carbonate chimney in the Lost City, which sits atop a massive undersea mountain near the Mid-Atlantic Ridge, has precipitated out of the relatively cool hydrothermal fluids that flow past. The sampling arm of Alvin, the Woods Hole Oceanographic Institution's submersible, is to the left. Photo courtesy of the University of Washington. The so-called Lost City is a "white smoker," draped in carbonate deposits that are precipitated out of high-pH seawater. The stalactite-like metropolis  some towers are up to 60 meters tall  is the first of its kind to be found so far, containing new species of bacteria living in its nooks and crannies, according to the first results published from the 2003 trip, in the March 4 Science. The chemical reactions that take place here occur at 40 to 90 degrees Celsius, relatively cool temperatures in comparison to other previously found hydrothermal vent ecosystems. This particular ecosystem lies 15 kilometers away from a mid-ocean ridge, where hotter volcanic-driven ecosystems known as "black smokers" tend to crop up. The darker hydrothermal vent systems pump out columns of smoky-looking clouds of hot minerals, at hundreds of degrees Celsius, which react with seawater at low pH. The Lost City, however, is characterized by geologic interactions, where the chemical reactions come from deep-seated magnesium-rich rocks that have been uplifted and become reactive with seawater as they are exposed. This environment might be similar to ancient komatiites, magnesium-heavy volcanic rocks from early in Earth's history  which led Kelley and her team to suggest that early life forms could have established themselves in just such relatively low-temperature high-magnesium sites, in addition to the better-studied black smoker environments. Other candidates include modern-day tectonic settings, such as spreading centers at the Mid-Atlantic Ridge and in the Arctic. Mars may also host similar environments, Kelley says. The geology also leads to very different microbial systems between the two ecosystems, Kelley says. Black smokers have volcanic activity leading to acidic fluids, rich in carbon dioxide and metals. "In contrast, with Lost City  with no volcanics and no volcanic gases  the microbes have had to figure out other products to use in their metabolism," she says, and they have turned to methane and hydrogen. "The surprise is the diversity of methane oxidizers, the multiple kinds of organisms that can do this." Usually, such diversity is not present, and higher temperature organisms are most abundant. Here, the interdisciplinary team found new species with a form of metabolism that is "really ancient," Kelley says, and related to the archaea, as shown by initial genetic analyses. Antje Boetius, a microbiologist at Max Planck Institute for Marine Microbiology in Bremen, Germany, who is not affiliated with the research, says that the new organisms may be "a turning point between methane consumption and creation," in the evolution of early life forms that rely on methane in oxygen-free, or anaerobic, settings. Usually, either methane eaters or makers dominate, but the Lost City has both biologically and nonbiologically made forms of methane, indicating both types of metabolisms are present. The scientific community, Boetius says, is "excited about having these microbes in the lab and trying to find out the genome." The Lost City, says Bill Reeburgh of the University of California at Irvine, who has done past work on anaerobic methane-driven ecosystems in the Black Sea and elsewhere, "is another example where methane oxidation turns out to be a huge process and apparently has been around for a long time." That may or may not affect scientists' understanding of the planet's methane cycle. "We don't know," he says. "We know that methane is increasing in the atmosphere," with increases in rice production, petroleum use and animal populations ever since the beginning of the industrial revolution, and from wetlands, Reeburgh says. "We've always thought that the ocean was a pretty minor part of this," but the puzzle has been "what's happening to methane before it makes it to the atmosphere?" In the meantime, the ocean "seems to be an incredibly efficient biofilter." Reeburgh also says that this discovery may be indicative of what early life was like before oxygen was abundant on the planet. "Methane is really the fuel driving these anaerobic systems," Reeburgh says, and it's "incredibly exciting" to see methane from both biologic and inorganic sources. Other sites like the Lost City remain to be found, and Kelley and her co-workers have already suggested where to look. "I feel incredibly lucky," Kelley says of the discovery of this entirely new ecosystem. "I doubt that something like this will come along again in my lifetime." The Lost City, she says, has "highlighted that the ocean is a big place, and there's a lot to be found there."